Rufus Jutzi, pastor, administrator, and conference leader, was born 26 June 1915 in Wilmot Township, Waterloo County, Ontario, Canada to Simeon Jutzi (5 January 1895-26 November 1971) and Leah Gascho Jutzi (12 August 1897-16 January 1946). He was the oldest child in a family of four sons and one daughter. On 16 October 1943 he married Ruth Good (27 November 1919-30 November 2018), the daughter of Jacob Good (15 May 1889-1961) and Wilhelmina "Minnie" Juliana Krueger Good (31 March 1893-1975). Rufus and Ruth had five children. Rufus died 3 November 2011 at Fairview Mennonite Home in Cambridge, Ontario. Rufus and Ruth are buried in the Hagey Mennonite Cemetery in Cambridge. Rufus Jutzi graduated from elementary school at the age of 12, and then worked on the family farm. He had no further formal education until after he had been ordained as a pastor. He was baptized as a member of the Steinmann Amish Mennonite Church in 1931. The family farm was lost in 1932, forcing Rufus to work at a wide variety of jobs, including farming labor and factory jobs in Kitchener. When World War II came, he served in Alternative Service in British Columbia from June 1942 to December 1943. He continued in Alternative Service on a local poultry farm for another 2.5 years. One of his younger brothers, Curtis, enlisted in the Royal Canadian Air Force and died in England on 31 August 1944. In 1947 Rufus and Ruth connected with the Floradale Mennonite Church while Rufus worked in nearby Elmira, Ontario in the sales and service of farm equipment. In 1950 a recently ordained deacon at Floradale, Henry W. Bauman, died suddenly, followed by the death in January, 1951 of minister and bishop Reuben Dettweiler. In March 1951 Rufus was in the lot with Ivan Gingrich for the ordination of a new deacon for Floradale. Rufus felt called to ministry, and as it happened, the lot fell on Gingrich. Three weeks later, on 1 April 1951, Rufus was ordained as minister for the Floradale Mennonite Church at the call of the congregation. Rufus took his new role seriously, and attended the Ontario Mennonite Bible Institute in Kitchener to increase his theological training. He was part of the Institute’s first graduating class in 1954. The summer of 1954 he also took a five-week summer course at the Winona Lake School of Theology. He served the Floradale congregation as pastor until 1964, at which time he took the pastoral position at Preston Mennonite Church where he served until 1974. During these years Rufus was also very active within the Mennonite Conference of Ontario (MCO) and the larger Mennonite Church (MC). He served on the executive committee of MCO for 12 years, seven of those as secretary (1954-1961). He served on the Mennonite Mission Board of Ontario for seven years, six of them as President (1963-1969). He served on the Rockway Mennonite School board for three years in the 1960s. He then chaired the steering committee that oversaw the school’s change from conference ownership to an association model (1971/72), and chaired the Rockway board in its first year under the new association. He taught Old Testament at the Ontario Mennonite Bible School & Institute from 1966-1969), and served on the board of governors of Conrad Grebel College from 1978-1982. Rufus was also active in local ministerial and community groups in areas where he pastored. 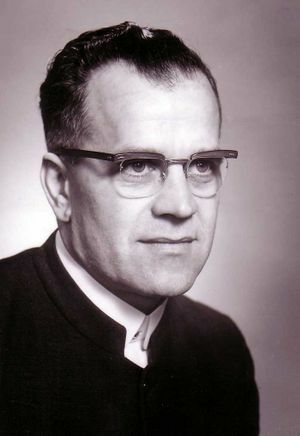 Within the denomination he served on the Mennonite Board of Missions executive four years (1964-1968), the Ministerial Committee two years (1969-1971), and the Mennonite Publication Board eight years (1971-1979), the last six years as president of the board. By 1974 Rufus Jutzi said he was suffering from “emotional and mental fatigue” due to his heavy congregational and conference responsibilities. He prepared for a change and took several business courses at Wilfrid Laurier University. He became the first staff member hired by the new Mennonite Foundation of Canada, serving as the regional director of the Ontario office for two years, and then as national manager until January 1981, when he retired. This work involved both estate planning and stewardship counselling. In 1981 Rufus began a series of interim pastoral assignments that included Pioneer Park Christian Fellowship (1981, 1985/86), Bluesky (Alberta)(1982/83), Tavistock (1988/89) and Brantford (1989/91). In 1975/76 he had also done an interim at Listowel Mennonite Church. He also worked for community groups, serving a brief times as Director of the Langs Farm Village Association and helping with the Preston Heights Housing Coop. Rufus and Ruth also found time for volunteer activities at Fairview Mennonite Home. Nonetheless, Rufus also found time for his favorite pastimes of reading and playing golf. At his funeral Rufus Jutzi was described as a man of high energy and consistent theology, who had a willingness to accept the challenges of leadership. His limited education and short stature did not hinder his years of dedicated service to his church and community. Jutzi, David. “Dad’s eulogy.” 7 November 2011. Jutzi, Rufus and Ruth. “Autobiographical reflections.” April 2010. “Jutzi, Rufus.” Waterloo Region Record (4 November 2011): B7. “Jutzi named regional director of Foundation.” Gospel Herald (8 January 1974): 38-39. Steiner, Sam. "Jutzi, Rufus (1915-2011)." Global Anabaptist Mennonite Encyclopedia Online. January 2016. Web. 21 Apr 2019. http://gameo.org/index.php?title=Jutzi,_Rufus_(1915-2011)&oldid=162527. Steiner, Sam. (January 2016). Jutzi, Rufus (1915-2011). Global Anabaptist Mennonite Encyclopedia Online. Retrieved 21 April 2019, from http://gameo.org/index.php?title=Jutzi,_Rufus_(1915-2011)&oldid=162527. This page was last modified on 1 December 2018, at 17:14.